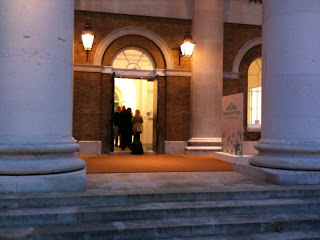 On Wednesday the 20th of January, bartenders and sommeliers from across the country converged on London’s Saatchi gallery for the undisputed (by me) industry highlight of the year: The Bartenders vs Sommeliers Superstars Competition. 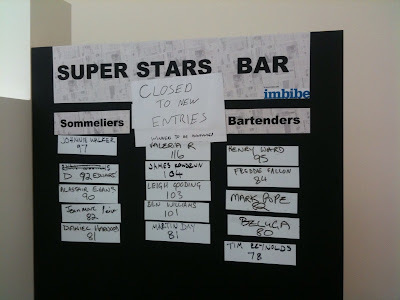 The drinks professionals were there to pit their skills head to head, in order to win not only an all expenses paid distillery tour trip to Cognac, but also to take home the highly coveted ‘Superstar’ title, currently held by the bartenders. Of course, the 7,000+ bottles of wine which were there for the Bibendum Annual Tasting may also have helped to coax them through the doors, but let’s not get bogged down in minor details. The concept was simple (though, arguably, not simple enough for some): bartenders and sommeliers prove their expertise in their own realm, before trying to beat each other at their own game. 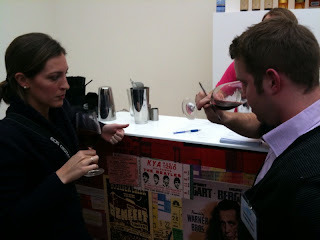 The competition tested two key areas of both disciplines: pouring accuracy, and tasting ability. To be fair to both sides, we took two ‘bar’ measures (25ml & 50ml) and two ‘wine’ measures (175ml and 250ml) and asked our hopefuls to freepour the designated amounts after just one practice run (not counting their entire professional career, of course). In the tasting element, both sides first tackled two wines, followed by two spirits. 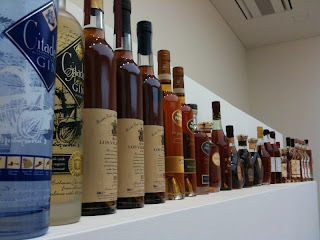 During this section, their task was simply to identify the variety of wine / spirit in the glass, together with the vintage. Sounds simple enough, right? Well, maybe not. In all fairness, this was one tough test. We threw in some real curveballs with the tastings – to the extent that not ONE competitor correctly identified all four our mystery drinks! James Kowszun, the very first competitor of the day, set the bar incredibly high. So high, infact, that he remained in pole position for almost seven hours! Below you see the final scoreboard of the day. A quick bit of mathematics will lead you to the conclusion that the sommeliers team has won back the title from the last years winners. Many congratulations to all involved. This highest score of the day was Valeria Rodriguez, although as a Bibendum employee, she was not eligible for the top prize of the trip to Cognac. Instead, this goes to our highest scoring sommelier: Johnny Walker. Proving his perfect palette and astounding accuracy was enough for Johnny to secure his place in the hall of fame, as well as his seat on the Eurostar. Well done Johnny! Honourable mention must be made to Dan 'Beluga' Ngyau of Epernay, Leeds, for the most accurate pour test of the day, Mark Pope, of Alimentum, Cambridge, for the highest wine tasting score, and Ben Williams of Bibendum for the best score of the day in the spirit tasting. I’m also very proud to point out that the Bibendumites scored very highly across the board. Well done all! Bartenders – it’s time to up your game. Let’s bring the title home in 2011!